A lot of people are scared off by the words “mindfulness meditation” and likely shy away from anything mindful. That’s a shame, because research shows that the practice of mindful meditation and mindfulness in everyday activities is powerful and effective. Perhaps one of the easiest ways to get involved with mindfulness is to begin mindful walking. To gain some insight into how meditation can work to help manage stress, I got in touch with David Lynch, Namaste Culture Limited, who practices in the United Kingdom. Is there a simple statement you use to help people be more present – even if they are resistant? Meditation can seem like a daunting prospect, especially if you’re already feeling anxious or low in mood. When addressing an audience who have little experience of it, I tend to talk more in terms of a practice that helps you still your mind, in the way that a run or yoga might do. I use terms like an invitation to experiment with a new approach to managing stress. I make reference to the findings of neuroscience and the many proven benefits of developing a regular practice. What is a mindful walk? How do you do it? 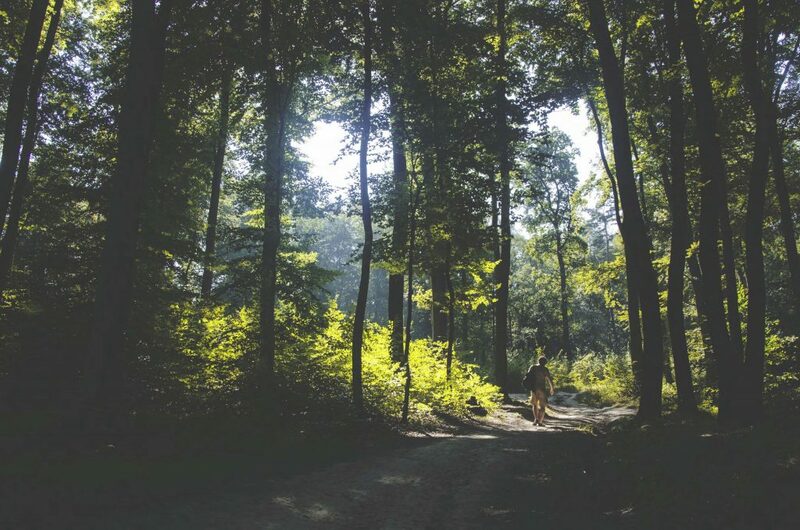 It’s like any other walk with an extra focus on all the senses, exploring both internal and external landscapes, and their interconnectedness. It’s walking more slowly than usual, less concerned with the final goal, more engaged with the sensations of the body, and savoring the impact of the external world on the inner experience. How long does it take while walking to let go of all the “noise” in your head and embrace nature? Not long at all, although it can feel like a long time, if you’ve come straight from a busy office environment, where you’ve been very goal-focused. Walking outdoors in nature helps you to switch off, to disengage from fast thinking and problem-solving. Suppose there aren’t any gardens near work or school or elsewhere to walk. How can you get the same effect otherwise? Can you walk up and down stairs, for example, and be mindful? Or do you need some calming influence you best achieve when in nature? In some ways, it can be easier to walk indoors, either in a circle or in straight lines, where the invitation is to focus very much on your body’s internal experience, without the distraction of nature’s beauty. I think you have to be clear in your motivation to walk purposefully in a room, to be yourself on track, but once you get going, the rhythm of your body and the simplicity of the task soon stills your mind. Even 10 minutes on your lunch break can make a difference. What are the specific benefits of mindful garden walks? My experience is that the combined regenerative effects of walking in nature’s beauty, breathing fresh air and practicing mindfulness, results in an immediate uplift in mood and outlook. It’s as if these combined forces offer a fresh perspective on whatever your mind is grappling with. This summer, I was inviting office workers to a 40-minute experience, enough time to get back to the office during a lunch break. [This included] 10 minutes [of] instruction, 20 minutes walking and 10 minutes debrief and discussion. Can you talk about the benefits of mindful walking to relieve stress? How does this work? Do you intentionally shut your mind off from stressful emotions, thoughts, etc., or do you go through a process of letting go? Mindful walking helps relieve stress because the invitation is to connect with the felt experience of stress in the body and mind, the opposite off switching off from it, or suppressing the unwelcome and sometimes painful sensations of stress. The mind is focusing on the moment by moment experience of the walking movement, the placing of the foot, the shifting weight from leg to leg, and not on the source of what’s inducing the stress response. Just keeping balanced and upright is enough to focus the mind. The invitation is to acknowledge and connect with the sensations, emotions and thoughts, no matter how unpleasant and unwelcome, e.g. I can feel my heart racing, I feel nausea in the pit of my stomach, I notice my racing obsessing thoughts. The additional benefit of walking in nature is that our mind’s attention falls on the sound of the rustling leaves, on the beauty of the light falling on the path, and gains a broader perspective on our experience. Suddenly, we note that we are part of something bigger and [better] than our stress response. Is it better to walk with others or alone – or does it matter? It’s probably easier to practice together when you first start, as it helps motivate you. However, once learned, mindful walking can be done anywhere and enjoyably by yourself; walking to work through busy streets, walking to your next business meeting. You just choose to do it with your attention on your felt experience, slow down and enjoy the sensations of walking. How long does it take to make mindful walking a healthy habit? Our program is for eight weeks, because that’s what the researchers/experts recommend to establish a sustainable meditation practice, to embed a change in our daily routine, to commit to a lifestyle shift in how we manage demands, responsibilities and stress. Of course, it is not enough to learn mindfulness practices for eight weeks and then to expect the change to happen, without maintaining a daily practice, or at least regular practice. We’re talking lifestyle change. That said, I have trainees who have said that although they no longer meditate on a regular basis, they have learned the tools to address stress differently when it arises, and therefore benefit from the skills development, no matter what. I am no expert in mindfulness. I am a practitioner, a facilitator of learning, a coach, who has combined several professional qualifications (teaching, counseling, management) and 30 years’ experience to create an experiential model of learning that adapts to the learners needs and vulnerabilities. They learn, I learn, and I love my work. Also check out My 10 Favorite Summertime Stress-Busters and 10 Quick Ways to Beat Stress. Want to get my free newsletter? Sign up here. I post highlights from my blog, my Daily Thoughts and more. If you like this post, please share it on social media. I also invite you to like me on Facebook, follow me on LinkedIn, Twitter and Google+. This entry was posted in Lifestyle, Meditation, Mindfulness, Motivation, Self-Care, Stress and tagged healthy lifestyle, how to walk mindfully, managing stress, mindful walking, walking on September 24, 2016 by 15893608.